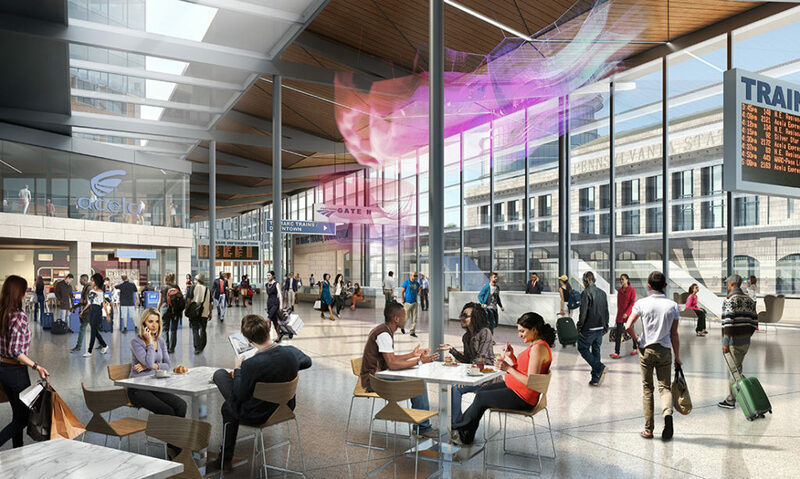 Penn Station Partners (PSP) has been awarded a contract to negotiate a development deal for Baltimore Penn station – and surrounding Amtrak properties – in the United States. The Baltimore-based team is comprised of a number of companies with global expertise – including Network Rail Consulting – who were chosen because of their successful record of project delivery, extensive experience and plans for the adaptive reuse of historic buildings. They will now work on the master development for the station – the eight busiest in the country – which will see it modernised and expanded to accommodate for growth. The team have proposed a multi-phased, mixed-use development that could bring as much as 1.6 million sq ft of development to the area. Preliminary concepts include a hotel in the historic station head house, as well as office and residential space to the north along Lanvale Street connected by an expanded concourse with new retail opportunities. Specific details regarding the development’s scope, design and phasing will be the focus of future engagement between Amtrak, the selected developer, stakeholders and the public. The Brandywine Realty Trust and Peebles-AZ Baltimore Penn were the other two shortlisted teams following a request for qualifications in 2016. So what are the busiest stations in the United States? Data taken from Amtrak for 2016. Ridership is calculated by adding boardings and alightings.